I have both goals and resolutions in 2019. I think goals and resolutions are like cousins, similar but yet not quite the same. A goal feels like something I can check off, something that feels tangible and attainable, something I can look back on and feel accomplished. A resolution is a little more tricky. To me, a resolution is an internal change, a switch in mindset, adopting a new perspective or a better attitude. It is not as clean-cut, there’s no check mark at the end. In fact, there really isn’t an end. Just a move forward, one step closer into figuring out who you are, and who you want to be. So with that, I’m here to tell you my resolutions and goals of the year, on the Internet for you all to see and damn well to keep me accountable. I’ll start with the heavy stuff, my resolution of 2019, which is to be kind to myself. Love myself a little more. Stop being so darn critical over every move I make. Less thoughts of wishing I was thinner, prettier, or smarter. Wishing I could give more to the people who love me. Because I’m slowly realizing that I cannot love others fully if I don’t even love myself. I say this with earnest and enthusiasm, but also with care and caution - because I know I’m going to mess up at some point in the year. I can’t erase every bad day, every criticism with the snap of my fingers. I am going to cry some times, I am going to go to bed thinking I could have done better. But I’m ready to be more conscious about it. Be less reactive and more thoughtful about those situations. Approach it with a new perspective, a new mantra. In yoga class, we set intentions. We set a mindset for the hour, something we want to embody and embrace in our practice. And lately, this resolution has been my intention. And even though it’s only been a couple of months, repeating this in my head every week is making a difference. So here we go, 2019, a year of kindness. A year of loving me. A year of compassion towards myself. And my goals! Don’t worry I wasn’t going to forget telling you. These are a little more fun. Well, one is, and that’s the one I’m going to tell you about. That is - I want to get back to baking. Maybe not quite as fiendish as medical school, but baking still does give me so much joy and even though life is busy, it still should be enjoyable! And besides, I have so many cookbooks, it’s time to start using them a little bit more. So while I may not be making original recipes (let’s be honest, a good quality original recipe takes time, numerous test batches, and I simply don’t have time for that), I want to still share my baking adventures on this small space. So my goal, my tangible, check-mark-that-off-the-list accomplishment of 2019 is to bake one new cookbook recipe every month. I have acquired so many gems - Bravetart this Christmas, A Common Table this past fall, Ovenly years ago, and way more - and it’s time to put them to good use! Not to say I haven’t used them at all, but I think setting this goal will get me out of my comfort zone and try new things, rather than going to my staples time and time again. 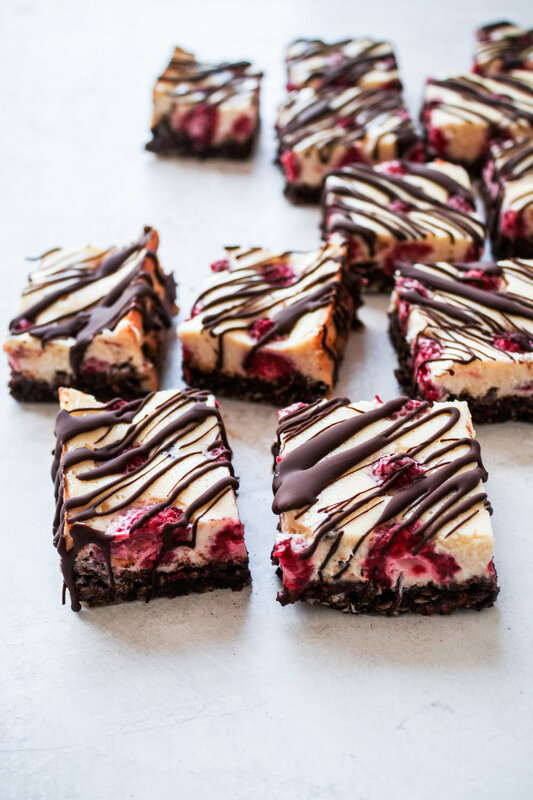 Starting with these raspberry ripple crunch bars from Erin McDowell’s beautiful book, The Fearless Baker. 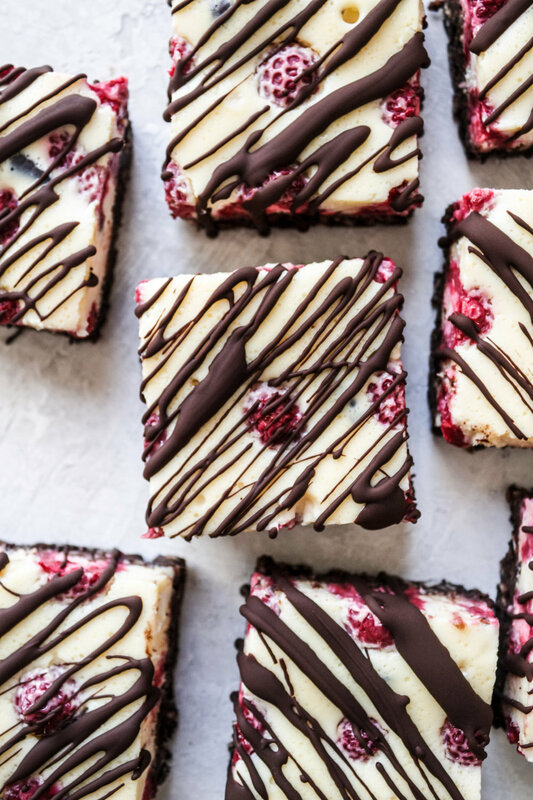 They are the most delicious cheesecake-like bars I have ever tasted, with a cocoa krispie bottom and tart raspberries studded throughout creamy custard… drool. And not too sweet! The use of bittersweet chocolate really cuts through all the sugar in the custard giving it a balance I am enjoying more and more as I get older. I don’t normally go for bars and I have never made anything like these before - and given my aforementioned goal it feels like quite a solid start. Happy, happy, happiest of new years! I hope 2019 brings you deep laughs and warm hugs. I hope it gives you a sense of renewal that we all deserve. I hope you love yourself a little more this year. Thanks for sticking with me. Preheat the oven to 325 F. Lightly grease a 9x13 inch baking pan and line with parchment paper, leaving 1 inch of overhang on the two long sides of the pan. Lightly grease the parchment. Make the crust: Sift the powdered sugar and cocoa powder into a large bowl. Add the Rice Krispies and stir to combine. Add the melted butter and mix until moistened. Press the mixture into the prepared pan in an even layer. Pour the melted chocolate over the crust and spread it into an even layer (an offset spatula is useful for this step). Make the custard filling: In a food processor, combine the cream cheese and granulated sugar. Add in the eggs 1 at a time, mixing in between each addition until well combined. Scrape the bowl well, then add the vanilla and mix again to combine. Pour the custard over the crust - it should flow into an even layer, but you can use a small offset spatula to coax it into the edges if needed. Bake until the custard is set and lightly golden at the edges, but still slightly jiggly in the center. This took me 55 minutes. Let cool to room temperature, then refrigerate for at least 2 hours. When the custard is thoroughly chilled, drizzle on the melted chocolate for the topping. Refrigerate for 5 minutes or until the chocolate sets. Use the parchment overhang as handles and lift the slab out of the pan. You can cut into bars or squares, then keep refrigerated until ready to serve. These were enjoyed by Andrew’s co-residents and my own co-residents. Sharing is caring!